With the myriad options available for decks and porches, it’s seldom that we have a request for a pressure-treated wood deck. A family in Haddonfield, NJ opted for just that after seeing the cost difference for composites. Wood decks have a reputation for warping, splintering and generally degrading in a short amount of time. The fact is, however, that has much more to do with the time, money, and effort spent on maintenance by the homeowner than is does the materials involved. Pressure-treated yellow pine is resistant to insects and moisture damage and is a sturdy and dependable structural material. On the other hand, it is also notorious for twisting, warping, spitting, and splintering as it loses its moisture content. Those effects can be minimized by applying an oil-based stain or sealer to the wood, soon after the wood deck has been erected, and treated annually after that. In addition, bolts holding railing posts and beams together should be tightened periodically. If the maintenance is addressed, you can expect many years of use, and for the deck to retain its appearance to a reasonable degree. Of course, the deck has to be well-built to begin with as well. None of this is to suggest that a wood deck surface is superior, or even equal to a quality, maintenance-free composite, but to reinforce the idea that it is a viable option–especially when budget is an issue, and should not be dismissed out-of-hand. The project featured here is a pressure-treated wood deck that was resurfaced because of the prior maintenance lapses mention above, and unfortunately, there were some original, antiquated construction methods employed on the substructure that had to be corrected. The homeowners were wise to immediately seal the new surface with an attractive, quality, oil-based stain. New lattice panels were installed, with one large panel hinged for storage under the deck. There was also a replacement of the main entry door with a solid wood door, stained and finished inside, and painted outside to compliment the existing façade. The original, solid mahogany storm door was salvaged and repurposed for the new entry. 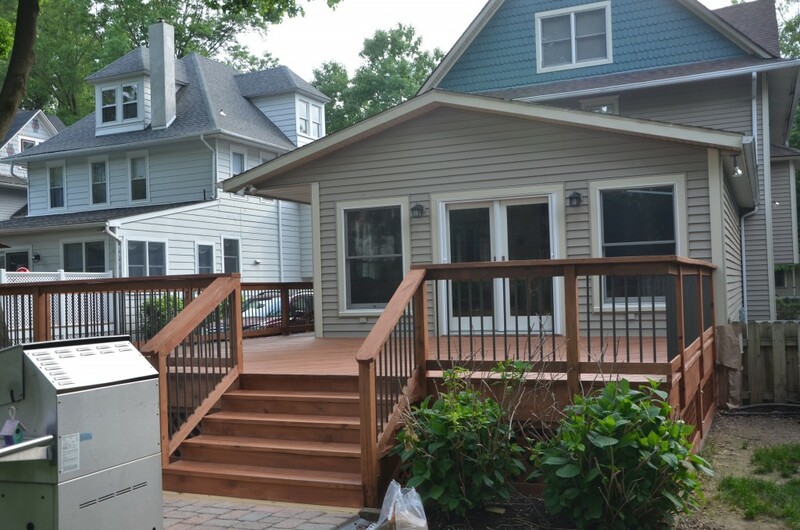 The new railing system was built with round, aluminum balusters that give the deck a unique look, and a folding dog-gate was built for practicality. Who says wood decks are out?